Many younger players receive equipment from their home associations, sometimes having few options to choose from. Below are a few tips to look for when sizing goalie equipment. 1. Goalie Pads. Clearly the most fun to pick out. Check to make sure the knee fits properly in the knee space and isn't too short or too high. Pads that are too long for younger goalies (i.e. their knee is too short for the space for the knee in the pad) make it more difficult to master moving properly in the net. 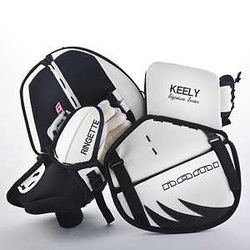 As goalies get more skilled and move better, then you can consider looking at bigger pads to help bulk up, but until she can move well, keep the pads fitting to the height of her knee. Pads that are too short (knee is too high for the space for the knee in the pad) might open up the thighs to open shots from the ring, and might also make the goalie look "small" in the net. 2. Stick. Often overlooked. A stick that is too short (the goalie has to crouch uncomfortably low in order to keep the stick flat on the ice) will make it difficult for her to move side to side comforatbly and consistently, and keep her stick on the ice the entire time. A stick that is too big, can also be too heavy to hold (resulting in too much time bringing the stick into proper placement when moving side to side), and can also put the goalie off balance in her stance. Goalies should stand in proper goalie stance in skates, and be able to keep the blade of the stick flat on the ice out in front of her skates, with her hand comfortably about the height of her knee. Key Stick Note - pointed out by Tori Goble of the Ottawa Ice in the NRL - please keep in mind that goalie sticks are already properly balanced and any cutting of the top of a goalie stick runs the risk of throwing off the balance of the stick, making it more difficult to keep the blade flat on the ice in normal goalie stance. (3) A goalie mitt (good for younger goalies who don't face amazing shooters and can get away without needing the extra padding on the hand and around the hand to help make those extra saves). 4. Goalie Skates. I recommend moving goalies to goalie skates once they decide to become full time goalies. The longer blade on goalie skates give better balance for goalies in their stance and while moving. Also, properly sharpened goalie skates (you can play with how sharp the skates need to be) makes a world of difference compared to playing on dull player skates.